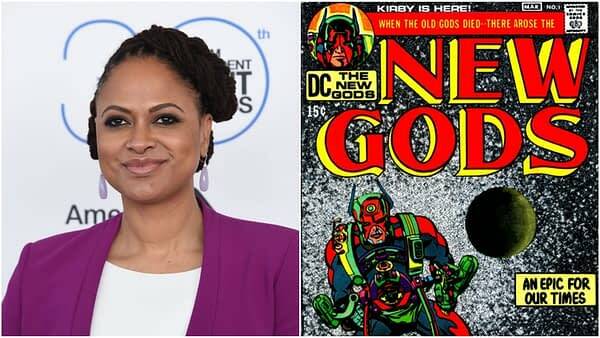 Warner Bros. is closing a deal with A Wrinkle in Time director Ava DuVernay to direct a big-budget adaptation of Jack Kirby‘s The New Gods. Once the deal is done, Deadline is reporting that a screenwriter will be chosen to craft the narrative and work closely with DuVernay. The expected budget should be $100M plus and shows the amazing climb DuVernay has taken since her original breakout film Selma. DuVernay showed her interest in the New Gods last year when asked on social media who her favorite character was, her response was Big Barda, a powerful warrior and wife of Mister Miracle, both creations of legendary comic artist/writer Jack Kirby. While the characters have crossed over into the main DCU, the New Gods were originally a freestanding world created and designed by Kirby in 1971 when he moved from Marvel to DC. The recent Justice League film used Steppenwolf as a character and referenced Darkseid, both characters from the New Gods or Fourth World saga. They were introduced in three comic series: New Gods, Forever People, and Mister Miracle. The New Gods came into existences, as the story goes, after Ragnarok. They inhabited two planets, New Genesis and Apokolips, and war ensued between the two. DuVernay will be the second female director to take on a Warner Bros./DC franchise. The first, of course, was Patty Jenkins, who had great success adapting Wonder Woman to film with Gal Gadot in the lead. Was Snickers Responsible for Convincing WWE to Change Moolah Battle Royal Name?